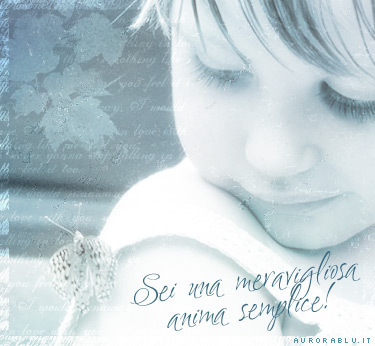 SEI UNA MERAVIGLIOSA ANIMA SEMPLICE! Quando ci sentiamo capaci a nulla.... dobbiamo ringraziare il Signore Iddio perché ci fa costatare ciò che veramente siamo: meschine creature..... Basta che noi ci lasciamo guidare da Dio e proprio quegli stracci (che siamo noi) nelle mani di Dio, serviranno per compiere.... cose meravigliose!! ARE YOU A WONDERFUL SOUL SIMPLE! When we feel capable of anything .... we thank the Lord God that leads us to note what they truly are: petty creatures ..... As long as we let ourselves be guided by God, and rags (that's us) in the hands of God, will be used to make .... wonderful things!